Summer is the best time for some sweet, juicy watermelon, and nothing compliments its flavors and textures more than the salty dryness of feta cheese. 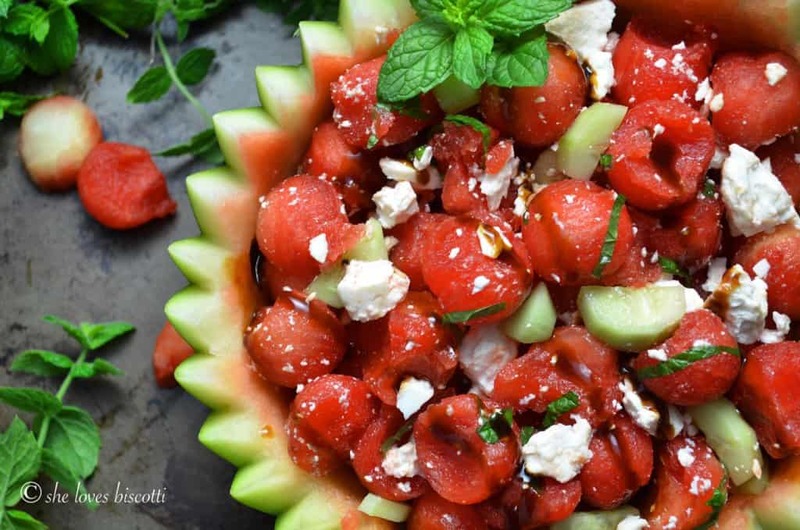 Like peanut butter to jelly, like cookies to milk – the watermelon and feta cheese in this Easy Watermelon Feta Mint Salad are just meant to be together. Summertime in Montreal is hot, hot, hot! I guess most people don’t associate Canada with heat – we are more renowned for our blistery cold winters – but let me be the first to tell you that summer here is a force to be reckoned with in its own right! 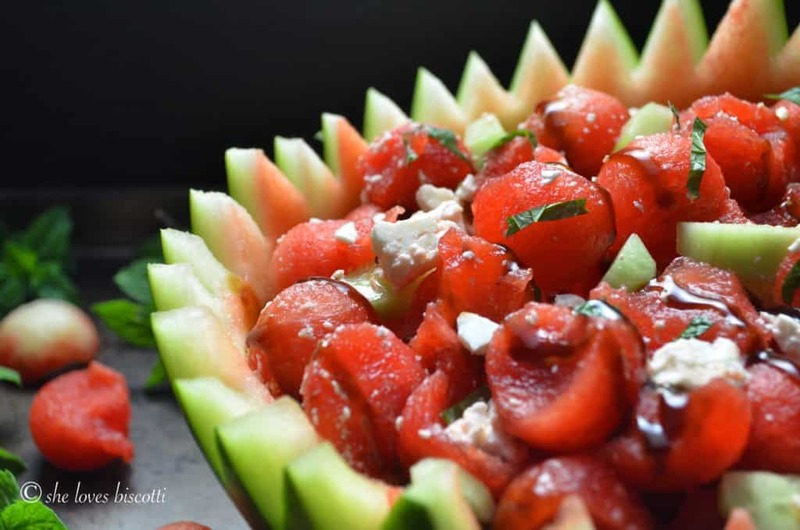 When those hot, humid and sunny days come, nothing cheers me up more than something that cools me down – and watermelon certainly fits the bill 😉 This Easy Watermelon Feta Mint Salad is a result of my flirtations with watermelon many years ago, coupled with my desire to find a refreshing way to eat this super fruit! To sweeten the deal even further, consider this. Since watermelon is actually composed of 92% water, it’s a great fruit to eat on hot days – helps you fight dehydration! It’s a good source of Vitamin C, as well, and at just 30 calories per 100 gram serving, it’s a fairly low-cal food too 🙂 So don’t be shy – let loose and go wild with watermelon!!! 1- Look for the field spot. This is a creamy, yellow patch, usually found on the underside of the watermelon. As you can probably guess, this is where the melon lay on the ground. A clear indicator of the melon not ripening properly is a white or non-existent field spot. 2-Take a good look at your watermelon. Once you know your melon has ripened properly, make sure it isn’t lopsided, or has irregular bumps. This would indicate that proper growth was not achieved due to a variation of sunlight and/or water. Examine the color. It should be a dull green. 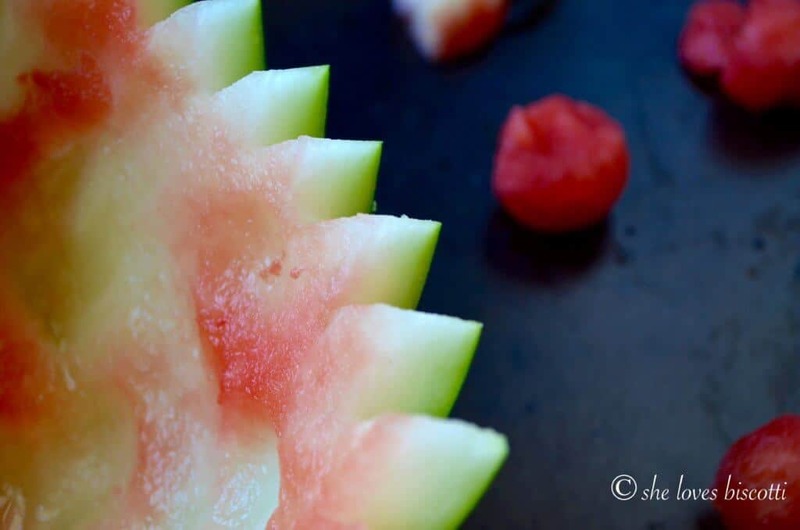 If your watermelon has a shiny appearance, it probably means that it is under ripe. Move on and find another watermelon. 3-Pick up your watermelon. Is it heavier than you were expecting? Great, you may have chosen a winner! As a general rule of thumb, a heavy melon is usually a ripe melon. 4-Press the navel. If it is hard, pick another one. If it is soft, great! You have one more criteria to meet. 5-Inspect the tail. A ripe watermelon will detach very easily from the vine it is connected to when it is picked. In fact, when a ripe and sweet watermelon is picked, it should detach very easily. The end result is a smooth spot where the vine was attached. If the tail is still green or if you have a long curly tail, these are signs that the watermelon was picked too early. Best to look for another one. 6-Knock, knock. Who’s there? Apparently, when knocking on your melon, the response should be a full thud! To be honest, this one still eludes me …but I will keep knocking away in an attempt to perfect this method. As was mentioned, this recipe was a direct result of some experimentation based on Jacques Pepin’s watermelon feta salad. I would encourage you to play with the list of ingredients according to your preferences and the availability of ingredients. Watermelon & Feta -a match made in heaven. Don’t keep this perfect pair apart any longer ...throw together this Easy Watermelon Feta Mint Salad today! 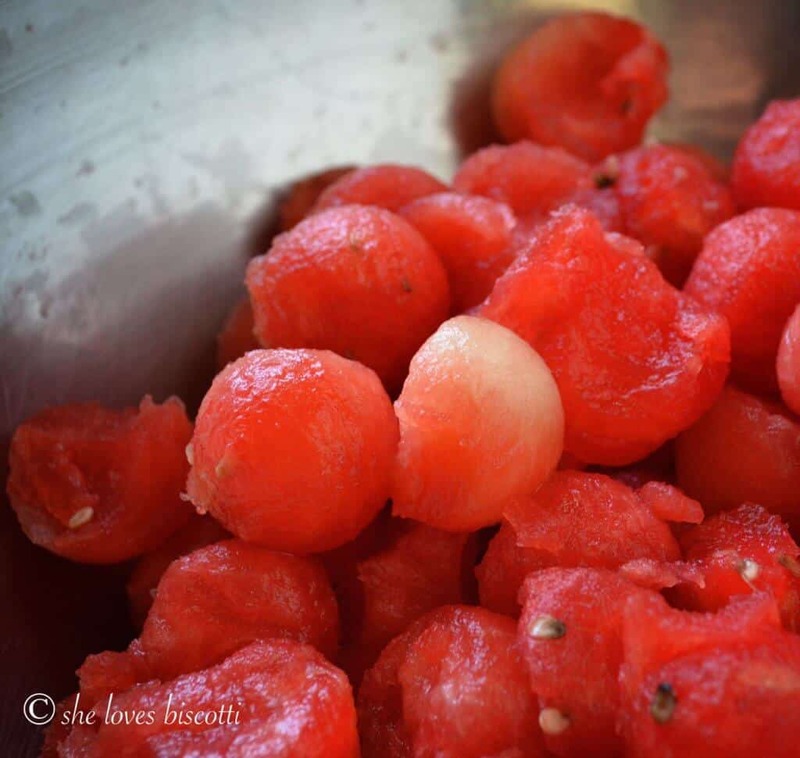 With a melon baller, scoop out the watermelon and drop in a large mixing bowl. 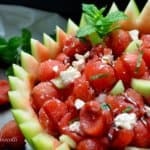 Gently toss together melon balls, crumbled feta cheese and minced fresh mint. In a small bowl, whisk together vinegar and olive oil to make the vinaigrette. The variations of the ingredients listed in this recipe will depend on the size of your melon and your personal preference. Love this recipe? Pin it to your SALAD board! Great looking salad… looks so refreshing! Perfect dish to make during this hot summer we’re having. Love the flavors.